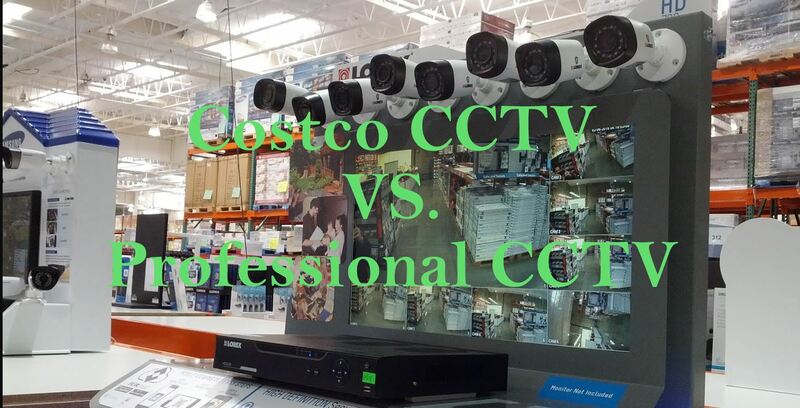 CCTV and security camera systems have become a very popular product being sold at major retailers such as Costco. Similar retail stores such as Walmart, Best Buy, Fry’s, and Amazon sell similar pre packaged systems in at very attractive prices. In this article I give you the pros and cons of the DIY bargain brands vs. professional grade CCTV and security cameras systems. Depending on the situation I have in the past recommended pre-packaged CCTV systems, for very specific cases such as use for coverage of a small indoor area that is constantly under good lighting and for basic uses such as baby or puppy monitoring. This is why it is important to consult with a professional no matter the circumstance so they can help you evaluate what it is your want your security system to accomplish for you in order to better determine what would work best for you. But 9 times out of 10 you will find that what most consumers are hoping the technology of their system will accomplish would require commercial grade equipment and a professional installation. The most important factor in determining the best system for a customer is their budget. But for first time buyers this can seem daunting due to the large disparity of prices between the different types of equipment. Buying a CCTV security system is similar to any other home improvement purchase you will make in the sense that whatever you buy will do the job BUT it all depends on how well you want that job to be done. You definitely get what you pay for when it comes to CCTV and security systems and when you pay for things like performance, video quality, system design, system reliability, user friendliness, Warranty, pre-existing system integration, and accessories you don’t end up buying a retail brand system sold at a big box store. In most cases, a multi camera prefixed system sold at Costco will cost significantly less (not to mention the amazing return policy they have). However, when considering the entire cost to include the installation cost it may end up costing you around the same price as buying a professional system with installation. For example recently I had a customer purchase a 4 channels HD camera system by Lorex from amzon.com and the total price with tax was around $400. Our company’s competitive rate for a basic installation is $500, this includes install of the cameras, DVR, and remote access setup. After a few days, the customer noticed that they did not get the coverage that they actually needed and later the customer decided to replace one of the cameras with a wide angle camera in order to cover the entire parking area. This change cost them $100. Then a few months later one of the cameras from the Lorex system stopped working and also needed to be replaced which ended up costing them an additional $150 in service charges. The total this customer ended up paying for the installed system is $1150. For less than $50 more the customer could have taken advantage of our 4ch Hikvision CCTV Security System promotion that would have covered all of the additional expenses and saved her unnecessary headaches and time. Most Big Box retailers such as Costco carry pre packaged security cameras packages that include only a 1 year warranty. The warranties usually require that if parts go bad they need to be removed and shipped back to a service center by the customer and completing long and complicated RMA (Return Merchant Authorization. At Halcyon CCTV Experts, we provide and install a system with a minimum of 3 year warranty for most of our Cameras, DVR or NVR recorders, and other equipment. ALL of our installed systems include a hassle and worry free 1st year replacement guarantee, if a camera or other component goes bad, we take care of everything that has to do with replacing the bad component and reduce the downtime as much as possible. Most basic CCTV systems are made of cheap plastic material that are not made for outdoor use. After few months of outdoor exposure, the lens cover will start to fade out which will cause the quality of the video to so as well., Halcyon use quality commercial grade outdoor cameras lens covers that are made of glass and will not fade. Most outdoor cameras should also be housed and we do this with outdoor rated metal and be IP68 rated which is the highest outdoor rate for security cameras. The number 1 complaint that we hear from people that purchase systems from an online retailer or Costco is the field of view of the cameras. The retailer will highlight the price but not the significant details such as lens size and picture quality. Many of the cameras that are include in those packages come with 4mm or 6mm lenses. This size is too small to view a lot of different angles and can be too narrow to cover most areas efficiently. When a professional custom designs the system for the environment, the right camera type and lens will be selected for the specific application and customer needs ensuring all goals of having a security system to being with and met. The performance category is the most important factor to look at, when installing a security camera indoors. Within a location with 24/7 good lighting conditions most cameras with the same resolution will provide very similar performance. However, the real test is when the conditions and the environment become more challenging, like low light conditions, back light, light/shadow, glare, lamps and other light sources and many other factors dramatically affect what you are able and not able to view clearly on your cameras. The hard drive is the most important component in a security system because it is where all the recorded events are kept on the HDD. Most hard drives are a mechanical component, and if not is designed to work 24/7 (like in a DVR/NVR recorder) they are prone to having many issues or just stop working completely. In this case the security system will not keep any recordings and in some cases will not be usable at all. Hard drive companies like Western Digital and Seagate have created a special lines of HDD, designed specifically to work with surveillance systems. These hard drives prices are higher, but for any true CCTV telecommunications professional they are necessary for any system to be considered dependable. Your drive is essentially a computer just like your cell phone is. And as we have said before, you definitely get what you pay for. Halcyon CCTV Experts includes these types of hard drives in all of our systems, and each drive includes a 3 years warranty. Most low cost packages does not include quality drives and instead use standard desktop hard drive that are not recommended or adequate for security systems. When installing a security camera system at an indoor location, with short run to each camera, the low cost cables will do the job. But things get tricky when need to run cables at a longer distance either all throughout a large home or outside. The biggest issue I see is when cables are needed to run outdoors. The low cost cables that come with the pre-made packages in most cases are thin, low quality cables that is are not adequate for outdoor use and definitely not weather rated. Cheap cables will work only for a few months in direct sunlight, rain, and other weather conditions before starting to make problems for your entire system, like connection or interference issues. At Halcyon CCTV Experts will use only high quality Coaxial RG59 or CAT6 cables when installing for outdoor cameras. They will be outdoor and UV rated to fit the environment conditions, when required, EMT metal pipes will be installed to protect the cables from vandalism and/or the environment .